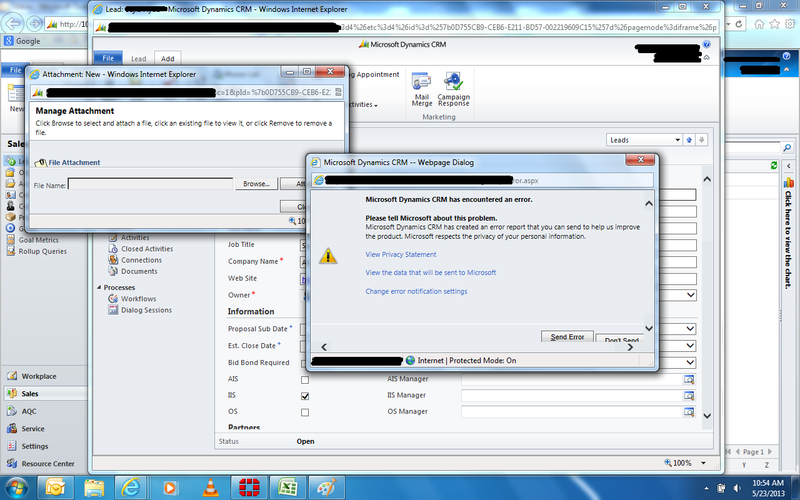 CRM Novice: Dynamics CRM 2011 and IE 10. Do they work together? Dynamics CRM 2011 and IE 10. Do they work together? This is exactly what I had asked the experts on Microsoft CRM 2011 forums and as expected the advise flooded. One very useful advise was a link to the KB article on Microsoft's Support Site KB/2743941. I would receive this error when trying to attach a file. Whether I try to click 'Send Error' or 'Don't Send', another similar popup would appear indefinitely. I haven't yet tried to upgrade to UR/12 but I'm confident.